Ever since the legendary punk-rock club CBGB closed down in 2006, it seemed as if New York was missing a piece of history. But there's no need to reminisce on the past anymore. 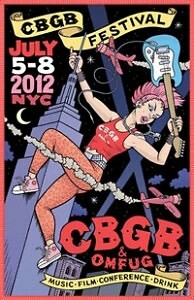 Folks can finally relive their epic nights spent at the club during the CBGB Festival from July 5th to 8th. With 300 bands, film screenings, music and film conferences, hopefully the festival will revive the music scene that the club generated in the 90's and 00's. The concerts and conferences will take place in 40 venues all over NYC and Brooklyn for four days so get your ripped jeans and band tees ready because after all, punk is not dead. Manhattan and Brooklyn, 7 PM, Tickets available on CBGB.com.